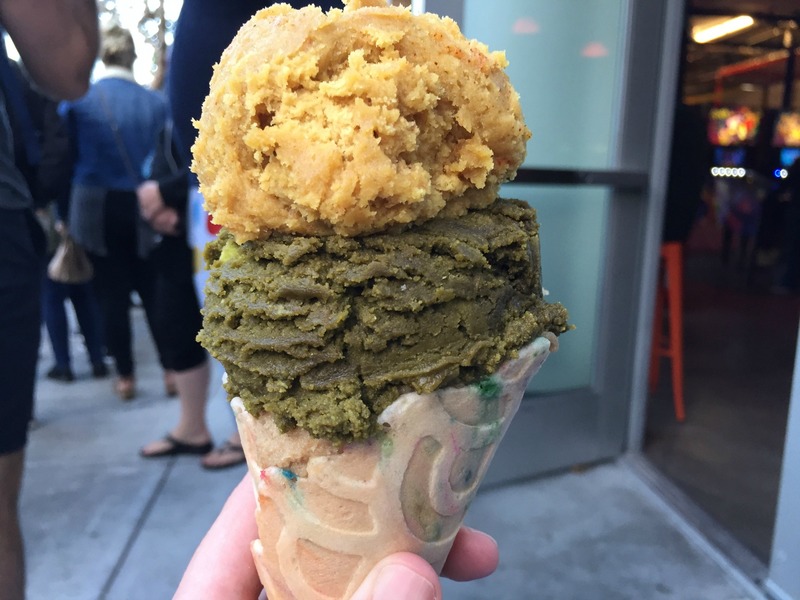 The Bay Area has seen several dessert trends in the last decade. There was the rise and fall of the cupcake. Then there was the fancy doughnut. And who can forget the cronut and its myriad imitators? 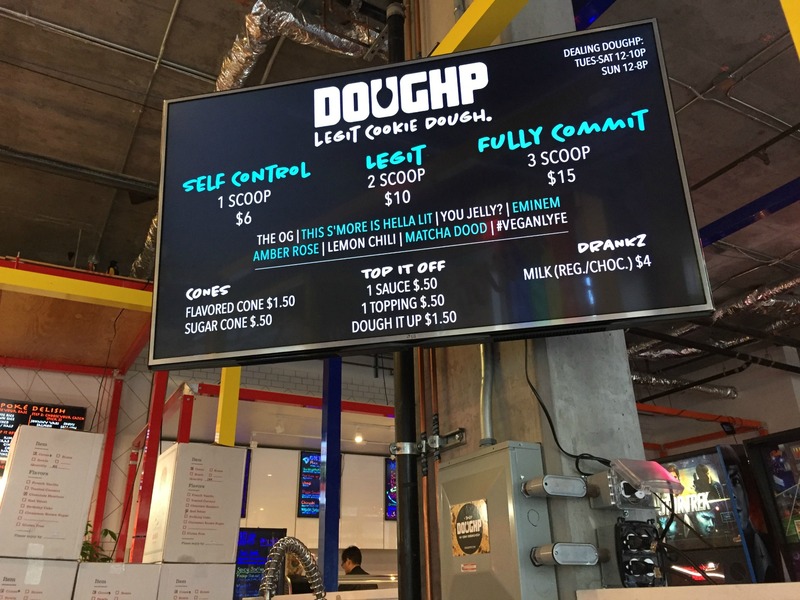 Now, there’s a new dessert de jour: cookie dough, available from DOUGHP--pronounced “dope”-- which opened yesterday in the Castro. Yes, cookie dough, the stuff you sneak from your mixing bowl, praying that you don’t get salmonella. No, DOUGHP’s dough doesn’t include raw egg (they use a flax seed mixture, and heat treat their flour to prevent E.coli.) Yes, you can bake it into cookies. 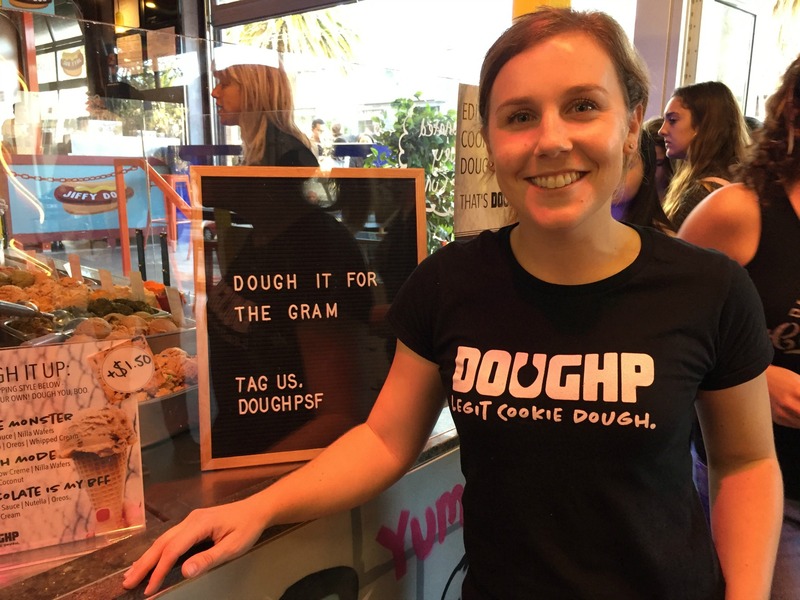 “Eat it or heat it,” founder and self-proclaimed “Doughp Dealer” Kelsey Witherow said with a chuckle. The 26-year-old Witherow, a cheery former techie who grew up in Sacramento, drew from her childhood when dreaming up DOUGHP. Her parents divorced when she was a kid, and when she visited her mom, Witherow was presented with a cookbook and her choice of what the two would make together. “Literally without fail, every time I would pick dessert,” Witherow said. Her obsession with sweets continued into adulthood, and when she flirted with veganism a few years ago, she eagerly dove into the world of vegan baking. She discovered that flaxseed served as a convincing egg substitute, and found that flax combined with real butter produced a delicious, safe cookie dough. Witherow debuted DOUGHP earlier this year at perhaps the most welcoming of venues: 4/20 at Dolores Park. Since then, she’s catered events, shipped her dough to far-off fans, and operated as a pop-up. One customer bought some at a pop-up and headed to SFO for his flight. TSA agents stopped him, and informed him that the raw eggs in his cookie dough made transporting it out of the question. “They were able to take it on, but the TSA was like, ‘Please don’t bring this again,’” Witherow said with a laugh. 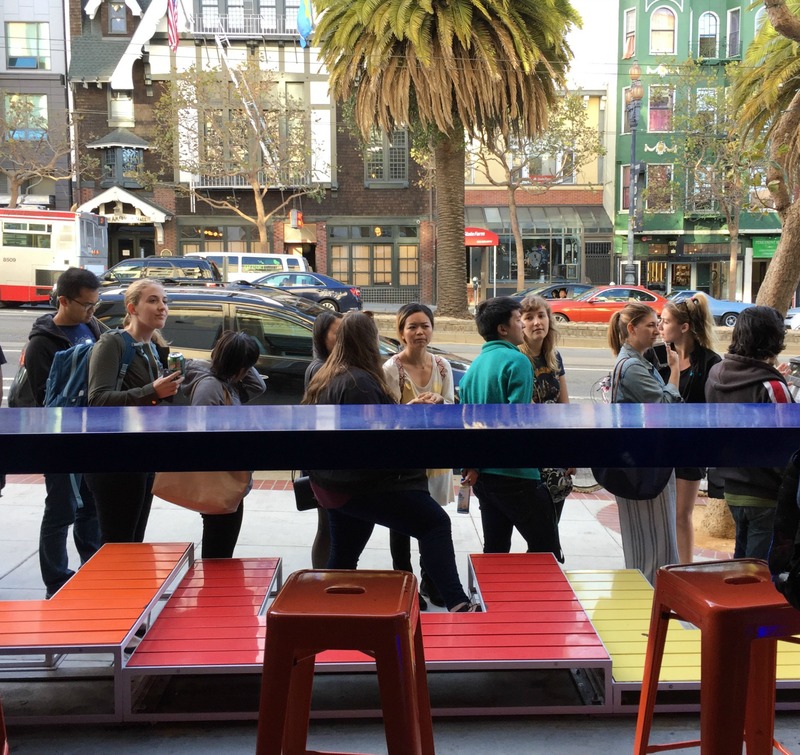 DOUGHP’s new permanent location is in airy Castro food hall The Myriad. On opening night, a line of twenty-somethings (I counted one child, who excitedly devoured a cone of Witherow’s “Eminem” flavor) stretched down Market Street as confused runners jogged past, while a bemused passersby craned her neck at the line and told her friend, “Yeah, I guess they’re all in line for the cookie dough.” Witherow’s colorful kiosk included a gold banner reading “This is hella doughp” and an Instagram-ready backdrop. 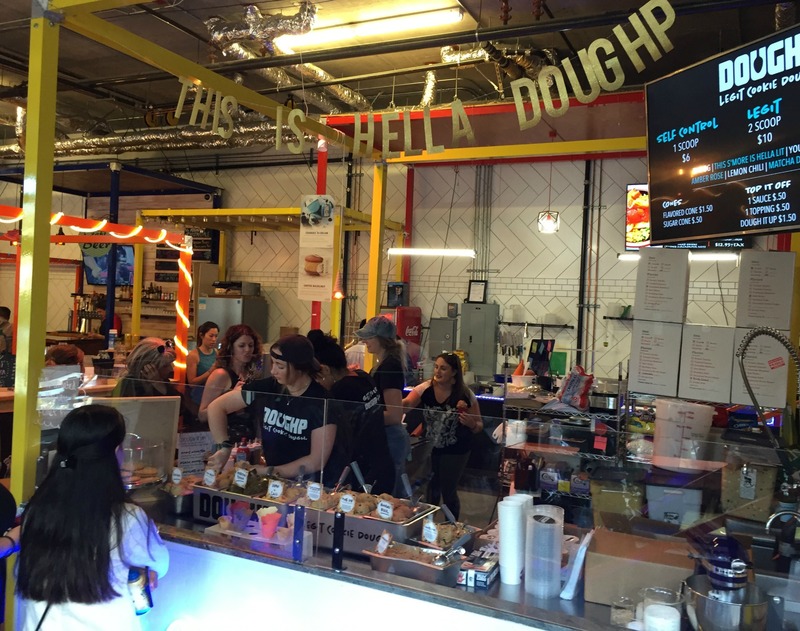 There were toppings like marshmallows and sprinkles, and sauces like caramel and Nutella, as well as a few sundae-like combinations, but the main draw was the dough itself. 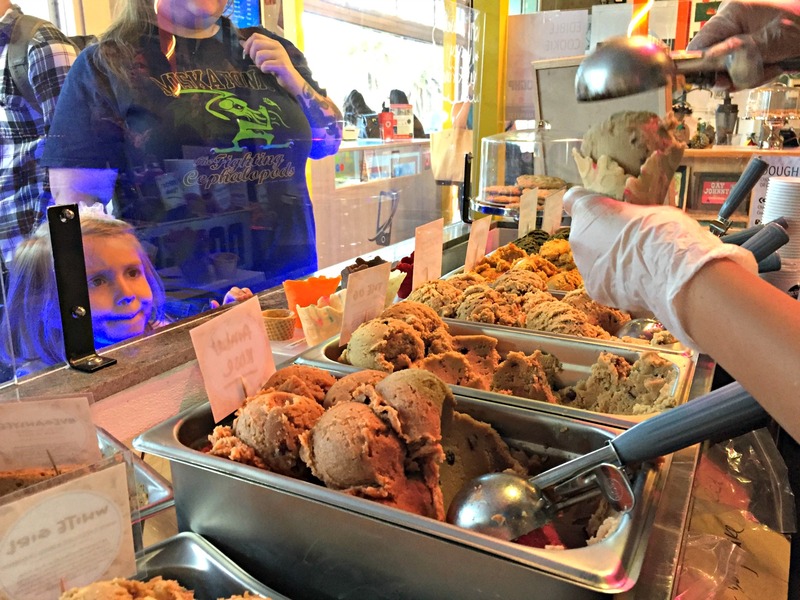 Workers clad in shirts urging customers to “Get your DOUGHP fix” served up scoops in a cup or cone (my Creamsicle flavored cone was almost eerily reminiscent of the real thing) in flavors ranging from traditional to trendy. Their names are the opposite of the sedate corporate marketing materials Witherow produced in her past life. They’re over the top, and unabashedly marketed to millennials: the White Girl flavor had dried cranberries and white chocolate mixed into a sugar cookie base, while This S’more Is Hella Lit was stuffed with chocolate, marshmallow fluff and graham crackers, which provided a satisfying crunch. None of her base doughs are two sweet, so the mix-ins work well, producing a balanced dough--even in the M&M flecked Eminem won’t leave you with cavities or a stomachache. The chocolate chip cookie dough was a perfect replica of the eggy originally, while the vegan and gluten-free version she offered provided a reasonable facsimile. 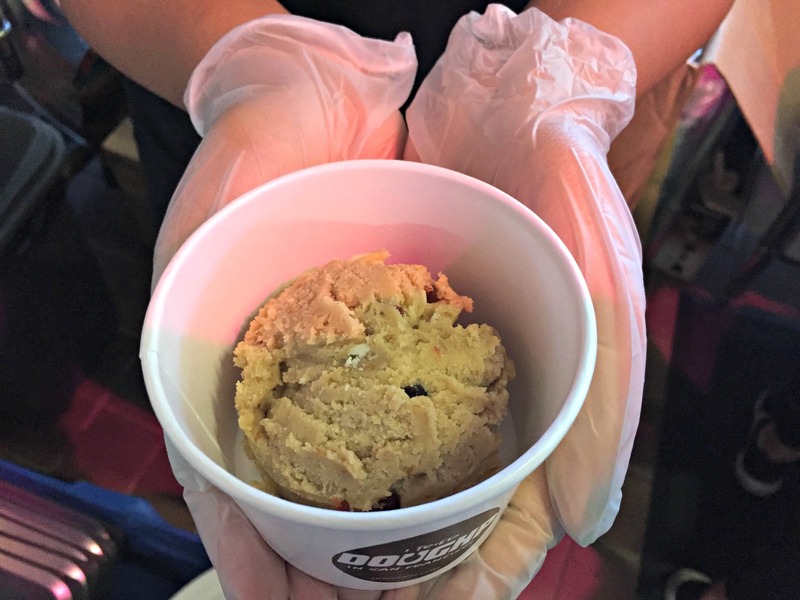 While chocolate chip cookie dough is probably popular enough to build a business around, Witherow’s experiments with other types of cookie doughs worked just as well. You Jelly? offered the comfort of a PB&J with strawberry preserves mixed into peanut butter dough, while the Matcha Dood nicely balanced the herbaceous tea with a snickerdoodle base. Two of my favorites were the Amber Rose, with its subtle notes of elderflower and rose in a cranberry sugar cookie dough, and the Lemon Chili, with its satisfying flash of heat at the finish. One of Witherow’s fans is seven-year-old Collin, who stumbled upon the DOUGHP kiosk on the first day at Spark Social in Mission Bay. He was receiving cancer treatment a the nearby UCSF children’s hospital, and promptly fell in love with Witherow’s dough. 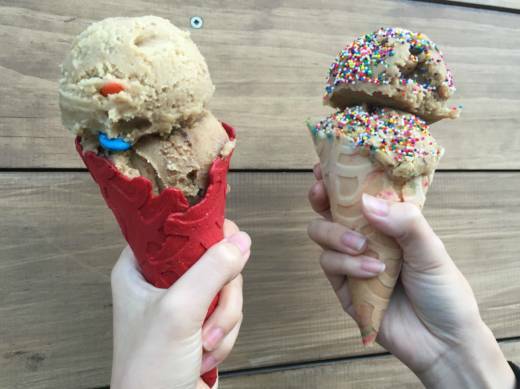 She worked with him to design a dough featuring his favorite candy (M&Ms) and donated 10% of the flavor’s profits to the family to help with their treatment expenses. Hours: Tue-Sat, 12-10pm; Sun, 12-8pm; closed Mon.